Protein – How Much? The never ending discussion. A recent meta-analysis of 49 prior studies with 1863 participants was published in the British Journal of Sports Medicine. The conclusions were not surprising. I’ve always used the rule of 1 gram of protein per pound of Lean Body Mass. So for a guy – like me – weighing 180 pounds with 20% body fat, you would top out at 140+/- grams of protein per day. Their conclusion: 1.6 grams of protein per kg of body weight. 180 pounds = 81.6 kg x 1.6 grams = 130 grams. Not a significant difference in calculation. Another way of looking at it – .70 grams of protein times your body weight. Summary/conclusion Dietary protein supplementation significantly enhanced changes in muscle strength and size during prolonged RET [Resistance Exercise Training] in healthy adults. Increasing age reduces and training experience increases the efficacy of protein supplementation during RET. With protein supplementation, protein intakes at amounts greater than ~1.6 g/kg/day do not further contribute RET-induced gains in FFM [Fat-Free Mass]. Let this be your guide to how much protein you need to maximize your gains from exercise. One more concept – don’t forget Gluconeogenesis: a metabolic pathway that results in the generation of glucose from certain non-carbohydrate carbon substrates, such as protein. Too much protein generates glucose and undermines Ketosis. One more post script: This only applies if you are actually doing Resistance Training. How eating too much protein in middle age can SHORTEN your life: Experts reveal this result of low-carb diets could be seriously detrimental to your health. Their thesis is that our needs change over our lifetime. In our early years, we may need 100 grams of protein a day, but that amount is reduced once you hit middle age – 50-65 years. Then it increases to stave off muscle wasting in our latter years. They go on to posit that if you eat too much protein in middle age – you will be shortening your life expectancy. [A] team at the University of Southern California analysed the diets of nearly 7,000 middle-aged people, discovering that eating a high-protein diet between the ages of 50 and 65 increased the chances of developing cancer, diabetes and other life-limiting diseases. But – here is the the thing – they are unable to really quantify the amounts. There are just too many variables to rely on the information they are selling. [M]any of today’s low-carb diets recommend upwards of 30 to 40 per cent of total calories coming from protein. I am unaware of any respectable Low Carb diet that is that High in Protein. Any person who works out is going to want 1 gram per pound of lean body mass. If you don’t work out – reduce that to .7 or .8. The end result is an average of 20% or less. Do the math! The High Protein label on a Low Carb diet is obviously one which annoys the hell out of me because it is just not true. Here’s one that got my dander up. The American Diabetes Association insists patients with type 2 diabetes should not go on a high protein diet as a means for weight loss because of the unknown long-term effects of protein intake on kidneys. Early signs of kidney failure often have no symptoms and can easily go undetected until they are very advanced, according to the National Kidney Foundation. All too often with diabetic patients the primary focus is on blood sugar control when it comes to diet recommendations. Practitioners often recommend a high protein, low carbohydrate diet to keep glucose levels low and it’s killing the kidneys. According to Mayo Clinic findings, some high-protein, high fat diets are stressful on the digestive system and the kidneys. These diets include animal protein and dairy products, which are high in fat, contributing to other factors of the disease such as non-alcoholic fatty liver disease, high blood pressure and heart disease. The American Diabetes Association insists patients with type 2 diabetes should not go on a high protein diet as a means for weight loss because of the unknown long-term effects of protein intake on kidneys. High-protein diets worsen kidney function in diabetics because the body may have trouble eliminating all the waste products of protein metabolism. OK – I’m ranting. I’ll stop. Check out this Press Release dealing with a study which identifies one of the mechanisms by which a high protein diet aids weight loss. Interesting experiment identifying the impact of protein. My only problem – the use of the phrase “high protein diets.” Never sure where the line is drawn. Low Carb Beer – with a Twist! I really don’t care for Low Carb beer. If I am going to drink, I’d rather have Wine or Vodka. Still, on a hot summer day or while watching a game, a good full bodied beer or two does the trick. It will undermine your LCHF eating routine – but – hey – we still need to enjoy. 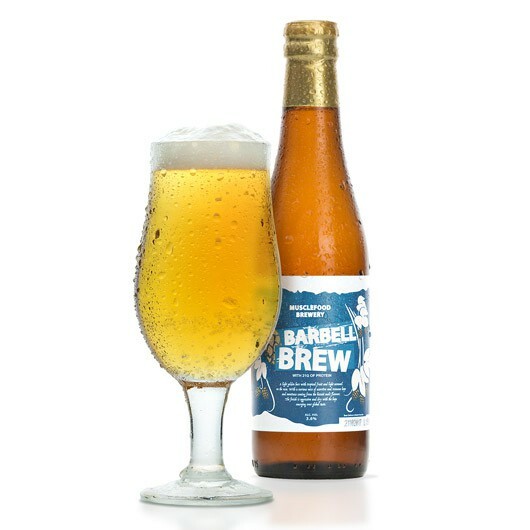 I spotted a report on this new beer on Flipboad: Barbell Beer. This is a high Protein – Low Carb Beer. Really – No kidding. Now – you can have your Protein fix after your workout – with a kick. Can’t wait for this to hit the states.